The Honor System Address by William H. Echols, 1929. In 1891 William Holding Echols came to the University as professor of Mechanical Engineering. Four years later, the tall, red-haired, fearless "Reddy" made a valiant effort to save the Rotunda from the fire consuming its annex by hurling one hundred pounds of dynamite from the roof in order to blast a gap between the two buildings. With a detonation heard fifteen miles away, the blast blew out all the Rotunda windows but was not ultimately successful in saving the Rotunda. Echols remained on the faculty for thirty-nine more years, famed as a lecturer, as Grand Banana of the Elis, and as the chief upholder of the Honor System the University's most famous tradition. Each year he addressed the first-year men on this code of ethics. In his 1929 address he proclaimed to the students that the University was now "as democratic as a roller towel," an assertion that would soon be challenged. 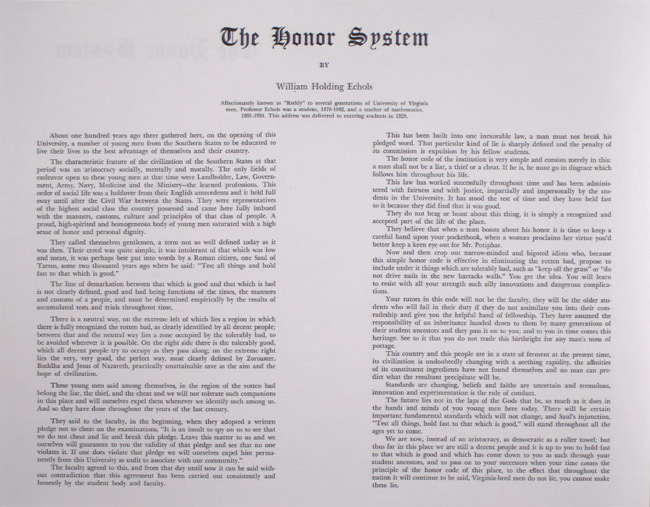 The Honor System was created following the shooting death of Professor John A.G. Davis on the Lawn. On July 4, 1842, Professor Henry St. George Tucker offered this resolution to the unsettled and frustrated students: Resolved, that in all future examinations . . . each candidate shall attach to the written answers . . . a certificate of the following words: I, A.B., do here by certify on my honor that I have derived no assistance during the time of this examination from any source whatever. The students passionately accepted this code of ethics and eventually assumed full responsibility for the System. It has since undergone many changes, but the philosophy of the Honor Committee is to maintain ongoing discussion of the System's philosophies and procedures to ensure that it remains responsive to the student body.